All Victims Recovered In Miami Bridge Collapse, Police Say : The Two-Way Police recovered five bodies from the wreckage Saturday and said a sixth person died at the hospital. Florida International University said engineers met hours before the collapse to discuss safety. 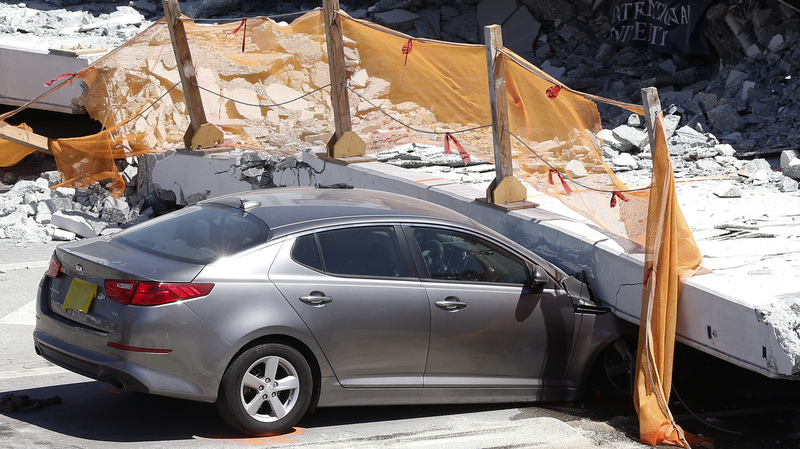 A crushed car sits under a section of a collapsed pedestrian bridge on Friday near Miami. Authorities are still investigating the cause. The pedestrian bridge, which was intended to connect Florida International University and the city of Sweetwater, collapsed Thursday afternoon on cars on the busy roadway below. The 174-foot main span of the bridge was put into place only five days before the collapse, The Two-Way reported earlier. "It has been a laborious, tedious process to remove 950 tons of weight, of rubble, of pieces of concrete, from above those victims," Perez said. Police released some of the names of the victims on Saturday: Rolando Fraga Hernandez, 57-year-old Oswald Gonzalez, 53-year-old Alberto Arias, and Navarro Brown. FIU student Alexa Duran, 18, was also killed, according to reports. The Florida Department of Transportation said the university was responsible for maintaining the safety of the bridge. "Our hearts break for the victims of the bridge collapse," Florida International University President Mark B. Rosenberg said in a statement Saturday. "Lives have been lost. Futures and families shattered." He said the university "is cooperating fully" with an investigation led by the National Transportation Safety Board. FDOT said an engineer on the bridge project left a voicemail for an FDOT employee reporting cracking in the bridge two days before the collapse, though it was not heard until a day after. However, the engineer, W. Denney Pate of FIGG Bridge Engineers, said in the voicemail that he didn't think the cracking was a safety concern. Engineers had also held a meeting Thursday morning "to discuss a crack that appeared on the structure," FIU said in a statement Saturday. "The FIGG engineer of record delivered a technical presentation regarding the crack and concluded that there were no safety concerns and the crack did not compromise the structural integrity of the bridge. This meeting lasted approximately two hours and included FIU and FDOT representatives." "A crack in a bridge does not necessarily mean that it's unsafe," the NTSB's Robert Accetta told reporters Friday. As the NTSB investigates how the collapse happened, the federal agency said Saturday that it identified pieces of the bridge to collect as evidence and was collecting documents about the bridge's design and construction. "Investigators will remain on scene for several more days gathering evidence, documents, and conducting interviews," the NTSB tweeted.